ChiIL Live Shows: INCOMING: LIL' ED & THE BLUES IMPERIALS TO PERFORM IN CHICAGO! 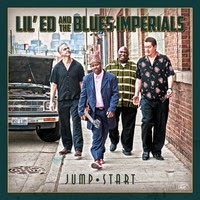 INCOMING: LIL' ED & THE BLUES IMPERIALS TO PERFORM IN CHICAGO! "Full of fire, Lil' Ed & The Blues Imperials hit the floor running and accelerate from there. The band's wildly energetic and seriously soulful new CD JUMP START is jam-packed with Lil' Ed's incendiary slide playing and rough, passionate singing, as the ragged-but-right Blues Imperials cook like mad alongside him. Produced by Williams and Alligator president Bruce Iglauer, it is a tour-de-force of untamed slide guitar, rock solid rhythms, heartrending ballads and authentic deep blues vocals. Williams wrote or co-wrote 13 of the album's 14 songs, which all overflow with the band's full throttle drive and serious sense of fun. JUMP START reveals a band firing on all cylinders and ready to spread the genuine houserockin' fever to their biggest audience yet. "It's all blues, really," says Lil' Ed. "Some of it will make you dance, some will ease your soul." Lil' Ed boasts a direct bloodline to blues history -- his uncle and musical mentor was the great Chicago slide guitarist, songwriter and recording artist J.B. Hutto. Live, Lil' Ed & The Blues Imperials simply can't be beat as Ed breaks out the deepest back-bends, the highest toe-walks, and the most authentic electric slide-guitar blues being played today. Garrett's risk-taking rhythm guitar work and Littleton's conversational, old school drumming perfectly complement Lil' Ed's and Pookie's rambunctious playing. Adding to the legend is Ed's storybook rise, taking him from working in a car wash to entertaining thousands of fans all over the world. He's made multiple appearances on Late Night With Conan O'Brien, and has brought his music to fans from Japan to Poland. According to The Chicago Tribune, "Williams represents one of the few remaining authentic links to pure Chicago blues."